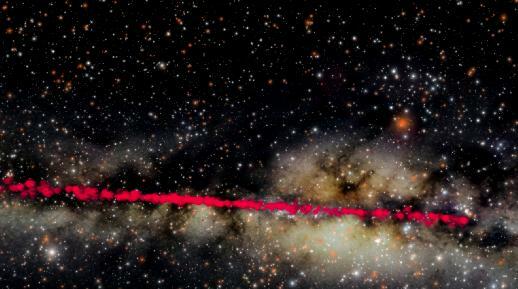 Astronomers have discovered hundreds of previously-unknown sites of massive star formation in the Milky Way, including the most distant such objects yet found in our home Galaxy. Ongoing studies of these objects promise to give crucial clues about the structure and history of the Milky Way. stretching across a portion of the MIlky Way. The scientists found regions where massive young stars or clusters of such stars are forming. These regions, which astronomers call HII (H-two) regions, serve as markers of the Galaxy's structure, including its spiral arms and central bar. "We're vastly improving the census of our Galaxy, and that's a key to understanding both its current nature and its past history, including the history of possible mergers with other galaxies," said Thomas Bania, of Boston University. Bania and his colleagues presented their work to the American Astronomical Society's meeting in Long Beach, California. The astronomers are using the National Science Foundation's (NSF) Green Bank Telescope (GBT) in West Virginia and Arecibo Telescope in Puerto Rico, and data from NASA's Spitzer and WISE (Widefield Infrared Survey Explorer) satellites. They plan to expand the effort to include Australian radio telescopes. The effort began with a survey of the Milky Way using the GBT. The scientists looked for HII regions by seeking faint emission of hydrogen atoms at radio wavelengths that are unobscured by the dust in the Galaxy's disk. By detecting these emissions, dubbed radio recombination lines, or RRLs, the GBT survey more than doubled the number of known HII regions in the Milky Way. They continued that work using the Arecibo Telescope, finding additional objects, including the largest HII region yet found, nearly 300 light-years across. Data from previous surveys with radio and infrared telescopes, including Spitzer and WISE, helped to guide the new search. Later work analyzed similar emissions of helium and carbon atoms. "The great sensitivity of the GBT and the Arecibo telescope, along with advanced electronics, made our new surveys possible," said Dana Balser, of the National Radio Astronomy Observatory (NRAO). "Data from WISE shows about 2,000 new HII-region candidates that we are studying with the GBT to confirm," said Loren Anderson, of West Virginia University. The work so far has helped refine astronomers' understanding of the Galaxy's structure. They found concentrations of star formation in a poorly-understood spiral arm and at the end of the Galaxy's central bar. "HII regions are the best tracers of the Milky Way's spiral structure, and this work is an excellent way to improve the map of our Galaxy," Bania said. Another major focus of the surveys is to study chemical variations in different regions of the Galaxy. Variations in the abundance of elements heavier than hydrogen can trace the history of star formation, and also indicate regions possibly containing material incorporated into the Galaxy through mergers with other galaxies throughout its history. "We've already been surprised to learn that the thin, tenuous gas between the stars is not as well-mixed as we thought," Balser said. "Finding areas that are chemically different from their surroundings can point to where gas clouds or smaller galaxies may have fallen into the Milky Way," he added. "Just as geologists traverse the landscape, mapping different rock types to reconstruct the Earth's history, we're working to improve the map of our Galaxy to advance our understanding of its structure and its history," Bania said. "The radio telescopes are our tools for making these new and better maps."